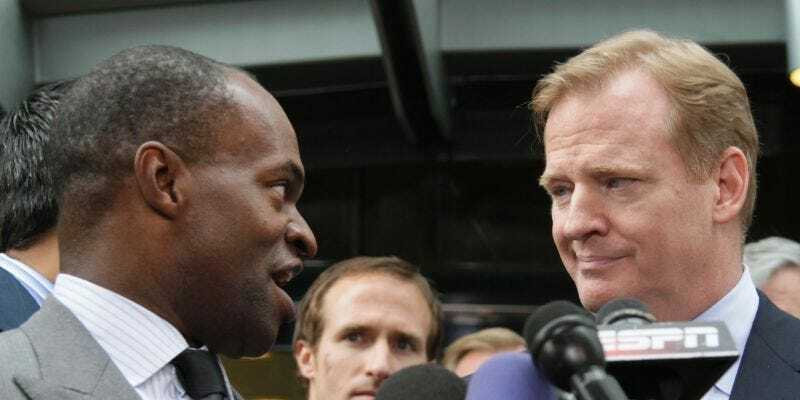 With Roger Goodell in full-on Reefer Madness mode, the NFLPA is working on a way to get the NFL to do something about its marijuana prohibition without making a major concession at the bargaining table. Yes, this is a half-measure that fails to address recreational marijuana usage, but it’s still a step forward for the union, which has to tread carefully here because the league’s owners have it boxed into a corner (imagine that). Both sides may desire the removal of marijuana from the league’s list of banned substances, but it’s the owners who are cynical enough to use a proposal all agree on as a bargaining chip. And because a lot of players use weed but only a few get caught—players who’ve never tested positive or been arrested on a drug-related charge only get tested once between April and August—pursuing a ban might not be in the union’s best interests if it has to come at the expense of some other concession that hits all players in their wallets. The CBA doesn’t expire until after the 2020 season, but the league and the union have come to terms in the recent past on changes to their drug policy outside of broader labor negotiations. Three years ago, they agreed to raise the threshold for a positive marijuana test from 15 to 35 nanograms. That standard still leaves the NFL with the strictest weed-testing regimen in pro sports, but it at least offers a precedent for something. The proposal Smith suggested on OTL lurches in the direction of treating marijuana use as a medical issue, though Smith was not asked to elaborate on what he meant by a “therapeutic approach.” Would that mean treatment rather than punishment for players like Martavis Bryant, whose acknowledged depression issues didn’t prevent the league from banning him for 13 months under the current policy? Would exemptions be permitted for players who can demonstrate they smoke weed or use cannabinoids to cope with the pain caused by playing football? Also, how would it even be possible to demonstrate something like this? There was an obvious disconnect when Goodell referenced the “health and safety of our players” even as he sounded an alarm about the alleged dangers of marijuana. The NFL is fine with pumping its players full of addictive pain meds if it means getting them back between the lines on Sundays. Will it listen now that its players are finally making it clear they want relief off the field, too?